Following his submission victory over Volkan Oezdemir, Anthony Smith wants a shot at whoever walks out of UFC 232 as UFC light heavyweight champion. “I just took out the No. 2 guy in the world. I’ve finished two former world champions back-to-back and then the No. 2 contender,” Smith said Monday on The MMA Hour. “The No. 1 contender’s fighting for the title and I think that Daniel Cormier has all but left the division. I don’t think that he’s coming back to 205. I don’t know who else would be in front of me. I don’t know who else is a legitimate threat to either one of those guys, no matter who wins the title. You might be able to throw (Ilir) Latifi in there, but if Gustafsson wins [against Jones], then that’s definitely out the window. When asked whether Jon Jones or Alexander Gustafsson, he felt the choice was fairly cut and dry. “I’d rather fight Jon Jones, because no one has a legitimate win over Jon Jones, and that’s the stuff that really gets me up,” Smith said. 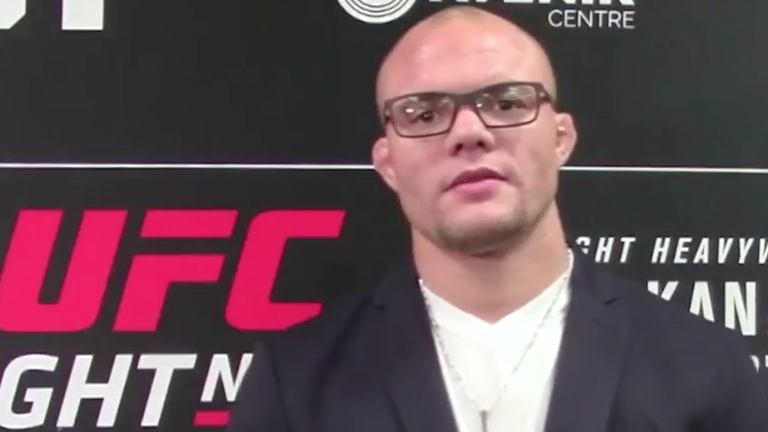 “Deep down, I truly believe that I can beat Jon Jones. But deep down, I know that I might not be able to — and that’s what drives me. That’s what motivates me. I’ve been thinking about Jon Jones since I’ve been at 205. It’s never been about ‘Shogun’ or Rashad or even Volkan. It’s trying to get through as many people as I can get through to get to Jon Jones. Smith feels that the stylistic differences between he and Jones would be able to stymie Jones.